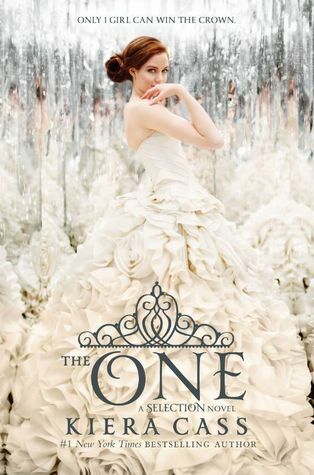 The highly anticipated conclusion to Kiera Cass's #1 New York Timesbestselling Selection series, The One will captivate readers who love dystopian YA fiction and fairy tales. The One is the perfect finale for fans who have followed America's whirlwind romance since it began--and a swoon-worthy read for teens who have devoured Veronica Roth'sDivergent, Ally Condie's Matched, or Lauren Oliver's Delirium. The Selection changed America Singer's life in ways she never could have imagined. Since she entered the competition to become the next princess of Illéa, America has struggled with her feelings for her first love, Aspen--and her growing attraction to Prince Maxon. Now she's made her choice . . . and she's prepared to fight for the future she wants. Find out who America will choose in The One, the enchanting, beautifully romantic third book in the Selection series. So remember how after I finished reading The Elite, I didn't really like America? Well, I'm sad to report that I didn't like her much more in this book. She was a little better, but how can she continue to doubt what is time and time again proven true? At least in this book she wasn't wishy washy -- she knew what she wanted...most of the time. That's the best we'll get from her. What made the book for me was Maxon. He and America had some super sweet romantic scenes in this book, and being the word nerd that I am, the prince said some things that made me weak in the knees. I will forever swoon over Maxon Schreave!! A few interesting revelations were made about who people were and I didn't see any of them coming. This book was a fast read -- I finished it on a nonstop flight to New York. All in all, I am quite satisfied with how the trilogy concluded. I can't really say I will miss America, but maybe Kiera Cass can just write a series of novellas entitled, "Prince Maxon says really romantic stuff to Flo all day long." You'd buy that, right?!? The One was everything I was hoping for and then some. The selection is down to the final four and America finally decided to fight for Maxon, which I would have been doing from the very beginning. Maxon is one of my favorite fictional males and I couldn't understand why America still doubted him. At the beginning of the book the remaining members of the selection were still out for blood. They didn't trust each other and the possibility of lasting friendships was almost certainly out of the question. After a few events, things slowly began to change. Some characters such as the King will never change, but I was very surprised by Celeste and Kriss. Celeste was not the heartless snob I always thought she was and Kriss had been keeping a secret that I never would have anticipated. The rebels are still out for change and attacks against the palace and the royal family are always a possibility. Violence is escalating withing the casts, but America and Maxon soon learn that one of the groups of rebels may actually be on their side. I thoroughly enjoyed this series and can't wait to see what Kiera will be working on next. According to Goodreads she is working on a new YA series.
" A new series by Kiera Cass, author of The Selection. In the as-yet-untitled YA romance, which was pitched as Matched meets Never Let Me Go, children trained in academies to be perfect friends can be purchased by the wealthy as companions, and a forbidden romance ensues." There is an additional Selection series novella scheduled to be released this winter about Queen Amberly, which I'm anxiously anticipating. I would also love a short story that provides a little more detail on what happens after The One. A glimpse at what life is like for Maxon, his princess, and the people of Illea a few years into the future would be an excellent way of capping of this exceptional series.